The Shanghai International Boat Show (CIBS) 2018 – Asia’s longest-established indoor event of its kind – is set to kick off next week. As an active supporter of the region’s sailing events and boat shows, Beneteau will be presenting three popular models – the Antares 8 OB, the Oceanis 41.1, and the First 22 at the show, backed by its local dealer Sea Dragon Yachts. The Antares 8 OB will have her Asia debut at the CIBS 2018. A multi-functional day boat, she is agile, powerful, and versatile – ideal for fishing trips and comfortable cruising as well as exploring new shores. She has a flared-out hull for improved sailing performance and even better handling, while her design makes living on board a real pleasure. As Beneteau’s most time-honored range, the Antares outboard line includes the Antares 6 OB, theAntares 7 OB, the Antares 8 OB, and the Antares 9 OB. The 6 OB and the 9 OB were launched last December in Paris, completing the renewal of this long-standing range. The Oceanis 41.1 will be the largest sailing boat to be exhibited at CIBS in recent years. She combines performance with a wide scope for personalization, and promises excellent balance and comfort at sea along with various crew configurations and lifestyle options on board. 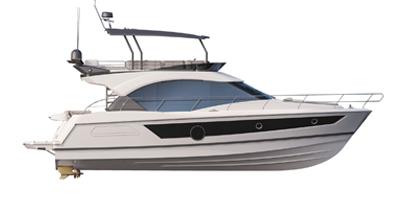 The First 22 will also be exhibited at the show, as a representative of Beneteau's small First range. Designed for training purpose, she boasts ergonomic and safety innovations to ensure that every sail is comfortable and safe, making learning easier and more fun. Based in East China and covering the market in North Asia, CIBS is considered to be the most active trading platform of day cruisers. The annual Asia Boating Awards ceremony held during the show honors the yachting industry’s best in Asia. Beneteau has been attending CIBS for 11 consecutive years. Lagoon, the world’s leading catamaran brand under Groupe Beneteau will also have its presence at the show. Don’t miss this nice indoor line-up.